The recognizable Newport Series Steel Bollards combine style and function to enhance community streetscapes. Developed with a simple, unobtrusive design utilizing commercial grade steel and a powder-coated finish allows this premium bollard to complement and protect outdoor spaces. 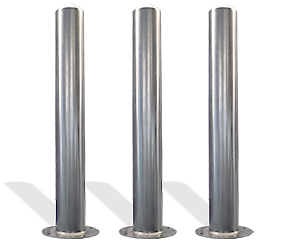 With 3' and 4' heights and in-ground or surface mount capabilities, the Newport Series Bollards are stylish, efficient tool to improve aesthetics while controlling traffic flow.